The Norfolk Southern class J-611 steams through Virginia. I like steam locomotives – who doesn’t. I lean more toward the non-streamlined engines, but the J-611 is mighty impressive. 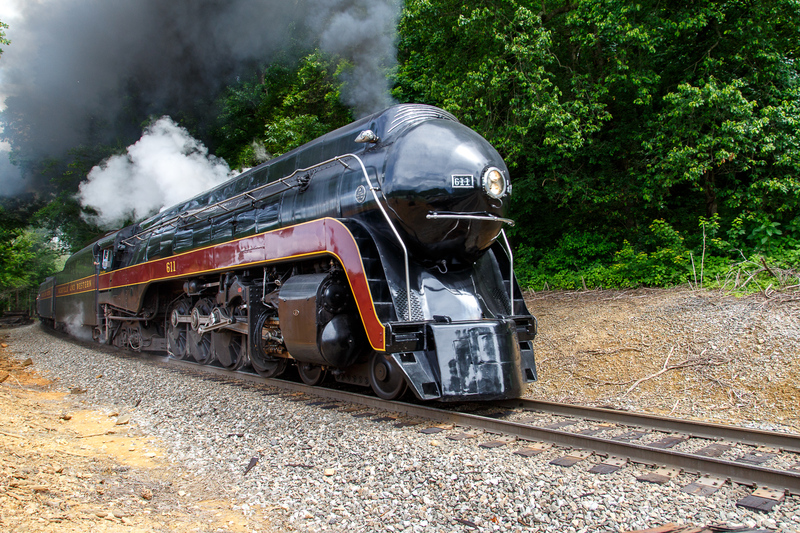 Last weekend, the J-611 made three excursions through the Virginia countryside. She was pulling 20 passenger cars, all fully occupied. I wanted to get some shots of her in the distance, but couldn’t decide on a location. I ended up at a crossing where the 611 roared by. She was going up grade which accounts for the extra smoke. Several crossings made for lots of whistles and bell clanging. Some fun. Some day I hope to perfect my panning skills enough to blur the wheels and rods while keeping the engine in focus.